Under the arrangement of the Hong Kong Police College, Senior Inspector Tang Hoi-tung attended the Leadership Programme (Supervisory) organised by the Scottish Police College from October 22 to November 3 in Scotland. Ms Tang joined the programme with 19 supervisory officers from Police Scotland. The training covered leadership theories, coaching skills, stress management, professional standards, media relations, counter-terrorism, managing public order and major incidents as well as policing models for fostering multi-agency collaboration. Training personnel of the Scottish Police College shared their expertise and experience through lectures, case studies and interactive exercises. 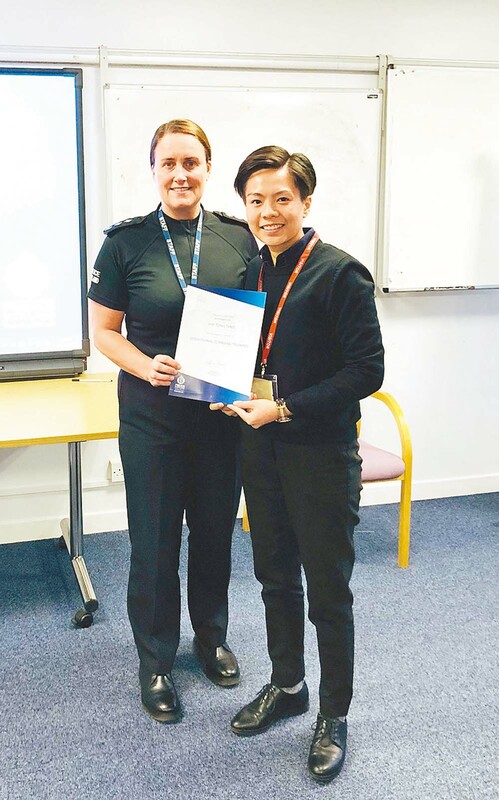 Ms Tang said the programme had not only broadened her horizons in the policing practices of Scotland, but also provided an opportunity for her to build networking with Scottish officers.